1984 is often regarded as the original dystopia, but Orwell himself acknowledged that the novel was somewhat derivative. His inspiration? 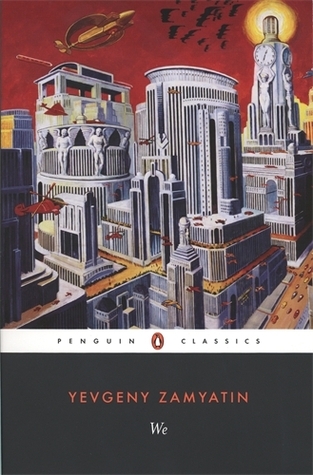 Yevgeny Zamyatin’s 1921 novel We, evolutionary ancestor of the totalitarian sci-fi stories so popular today. It’s easy to dismiss the book as cliched until one places it on the continuum of speculative fiction and remembers that it probably pioneered many of the now-common tropes it contains. Aside from being a fascinating exercise in literary archaeology, We is a solid novel in its own right. In Zamyatin’s future, a “United State” has taken control of civilization and tuned its functions to clocklike precision. Citizens, identified by numbers rather than names, behave more like machine parts than human beings. Each hour is meticulously scheduled; permits issued for sexual visitation eliminate lust and jealousy; everyone resides in glass-walled apartments, fully aware they are under constant surveillance. But conquering the world isn’t enough: the State is building a spaceship to spread its power to the stars. The project’s chief engineer, D-503, begins keeping a journal to send with the ship as a record for alien readers. He starts out extolling the virtues of his tightly ordered society. Then he meets I-330, a woman who challenges all his accepted beliefs. Initial revulsion turns to fascination as D-503 discovers I-330’s association with Mephi, a group plotting to overthrow the State. The journal becomes a chronicle of revolution, and of D-503’s private struggle between I-330’s influence and his commitment to the status quo. It’s been awhile since I read 1984, but We struck me as a more complex story in many ways. D-503’s vacillating loyalties make him a more psychologically compelling protagonist than Winston, who opposed Big Brother right from the beginning. It’s interesting to compare the function of language in the two dystopias. Both control it to maintain order, but in opposite ways. In Orwell’s vision, “newspeak” prided itself on limiting vocabularies and, consequently, forms of expression. Zamyatin’s United State, conversely, harnesses language for its own glorification, employing poets to sing the State’s praises or compose odes to the beauty of mathematical equations. Regarding the prose of the books themselves, even in translation Zamyatin’s writing is elegant and evocative. We falls a bit short in some areas. Other than D-503, there’s not a lot of character development. Readers never learn how I-330 first became affiliated with Mephi or how the group itself originated. The narrative thread frays as the story progresses and the sequence of events becomes a little hard to follow. However, it delivers a satisfying twist at the conclusion, evoking one of the book’s many memorable quotes: “A man is like a novel: until the very last page you don’t know how it will end. Otherwise it wouldn’t be worth reading.” I won’t reveal how D-503 “ends”, but the novel is definitely worth reading. What I think is more humorous is how Orwell accused Huxley of copying We in Brave New World. And then Orwell much later wrote 1984 which is much more similar to We than Brave New World… ah, the ironies. Perhaps I should have called “1984” the best-known totalitarian dystopia. Jack London certainly precedes Orwell in the literary timeline, but most casual readers are unfamiliar with “The Iron Heel”, while everyone can understand a reference to Big Brother (although I always wonder how many people associate it with the reality show rather than the novel)! Haha, but I do not think that they lacked original ideas. Orwell took an ultra realist approach and Brave New World is MUCH more wide-ranging in its satire. Although there are similarities between “We” and “1984” they are stylistically completely different novels (as you know).